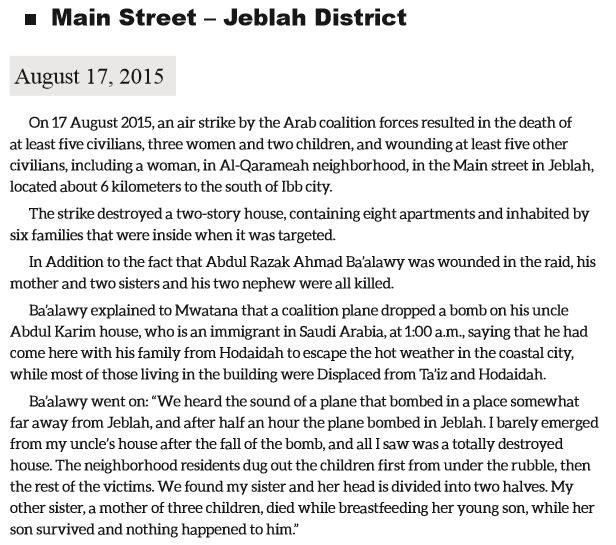 On the 17th August 2015, the Saudi led coalition airstrikes killed at least 5 civilians including 3 women and 2 children, and wounded at least 5 more civilians including a woman, in the Al-Qarameah neighbourhood in the main street in Jeblah, 6kms south of Ibb city, when a 2 story house containing 8 apartments housing 6 families was targeted. Most of the residents were believed to have been displaced people from Ta'iz and Hodaidah who were then displaced for a second time. There were no militants believed to have been in the area.